Here are some of the 2019 wedding trends you need to know if you’re getting married this year so that your big day is a truly memorable one. 2019 sees the return of classic cuts and simple fabrics. Many brides getting married in 2019 will opt for gowns with sleeves. Minimalists can rejoice because 2019 heralds the return of classic designs and simple styles. Surely, the poster girl for this trend is Meghan Markle and her striking yet simple bracelet-sleeved, boat-necked Givenchy wedding gown and halter neck reception dress. For 2019 weddings, greenery continues to be a classic go-to shade, with flowers and foliage becoming more organic and lush. Florals will be natural, whimsical and romantic. Check out Austin event rentals for the best outdoor rentals for weddings. We’ve seen a lot of impressive wedding cakes, but 2019 will welcome even more jaw-dropping creations. The 2018’s royal weddings are likely to inspire couples to make more opulent choices. Metallic touches, personalized monograms and regal piping will be on everyone’s cake agenda to take guests’ breath away. It’s all about custom-made – let your imagination soar! are some of the most popular summer blooms set to appear in a big way this year. Planning a wedding can be pretty stressful, more so with the added pressure of Instagram and social media. It is so easy to get caught up in how your wedding looks on social media, from the wedding gown to the wedding venue, the make-up, the flowers, the décor and just about everything. Let a party rental Los Angeles specialist help you to create the wedding of your dreams. I know I said I won’t watch it but I did. Napilitan, ok. I kinda knew what’s gonna happen already – may nabasa ako’ng Kita Kita Spoiler at napaka-accurate nya. Wait, ako lang ba ang nag-eenjoy sa spoiler? Anyway, I won’t encourage you to read this post if you haven’t watched the film yet. Pero kung gusto nyo masirsa araw nyo, sit down and join me as a I dissect the movie one by one. FYI, walang kwenta ‘tong review na ‘to. Do I like it? Yes-No, for many reasons. Do I like the ending? No!!! Nakakabanas! Bakit kelangan mamatay ng bida! Hindi ako sanay! Lumaki ako sa kultura na dapat ang bida, laging masaya. Bakit kasi walang kontrabida para sya na lang ang mamatay!? Worth it ba’ng panoorin sa sine? Yes! Maganda ang cinematography. Panoorin nyo! It’s now, it’s never! Nothing beats the cinema experience no matter how big your TV is. Uulitin ko ba’ng panoorin? Yes! Kung libre. Yun last part, it’s something I would watch again and again and again on youtube. Sa’ng part ako naiyak? Nun kinanta ni KZ Tandingan yun 2 Less Lonely sabay flashback. Nakakadala. Ugh. Actually, naiyak yun isang mata ko. Ewan kung bakit 50% lang ang niluha ko. Sa’ng part ako natuwa? Kay Empoy! Personality beats looks everytime. I love love love this part! Favorite scene? Yun part na yan. Very poignant. Tsaka yun kiss! Moral of the story? Akala ko sa Commnwealth ka lang wag tatawid, nakakamatay! Sa Japan din pala. Saan ako naguluhan? Hindi ko alam kung bakit “baby dragonfly” ang tawag ni Empoy kay Alex. Walang backstory. Ano’ng part yun hindi ko na-appreciate? Nun halos sirain ni Empoy yun buhay nya kasi nag-break sila nun ex-gf nya. Seriously? Who would do that? Saan ako na-curious? Si Alex, tour guide. Curious ako, ano’ng trabaho ni Empoy sa Japan? May dala kasi syang laptop bag. Kung ako ang Director and Scriptwriter, ano’ng ending? Makukulong si Nobu! Yun girl, mababaldado. Gusto ko buhayin si Empoy, and they will live happily ever after. Ganon! Pero! Baka pumayag din ako na mamatay sya, sa ibang paraan. Ang bobo kasi nun pagkamatay. Kung ako si Alex, forever guilty ako. Paano kung sa heart failure namatay si Empoy? Ano’ng mas masakit, yun mamatayan ng mahal sa buhay dahil sa aksidente o sa sakit? Yun aksidente, it could have been avoided. Pero kung chronic disease/genetic disease, ano’ng laban mo? Paano nga pala sya nagka work permit, is he fit to work? Recipe for the success of this movie – awesome film location + familiar soundtrack + funny and relatable characters. All in all, maganda yun movie. Cliche but fresh. Simple but complicated. Ordinary but distinctive. Prepare to be LSSed. Hanggang ngayon pinapatugtog ko pa din yun cover ni KZ sa Wish FM. Ayokoooo na! On Fashion: Black jeggings! Very very comfortable and affordable too! On Faith & Reason: I can do all things through Christ who strengthen me! On Family: Thankful for my sister for all the support – make up, sine, buffet etc. On Facebook: I am still soooo bad at replying to comments. A nicely filtered profile pic makes a lot of difference HAHAHA. On Friends: My thoughts from years back are still the same – matutong makiramdam. Huwag ipagsiksikan ang sarili sa mga taong ayaw ka namang makasama. On Travelling and Exploring the world: Not a priority. Pero kung may manlilibre, let’s go! Hope to visit Bali. Vietnam. Cambodia. SOMEDAY! Japan also. On Cooking: I have the potential t o become a chef! Charotttt! Ang totoo I have the potential to become a good….wife and mother. Mas lalong Charottt! HAHAHA. On Deodorant: Tawas forever! Please make tawas in “paste” form so it glides easily on my kili kili. Hassle! On Beauty: Ponds anti aging BB cream to perfect all my imperfections, plus BYS eyebrow gel to make my day complete! I was never a make up person until maybe 2 years ago, nowadays, I don’t go out without any colors on my face. I feel so naked and incomplete, in fact when I look at myself in the morning without kilay, I always panic. Ano, noo tapos mata agad?? On Home: Praise the Lord for the automatic washing machine! On Life and Living: I vow to live fully in each moment. On Internet: My mother knows how to use FB already! On Love: How come I am still single?? On Music: OMG, I love Pop!!! On People: Practice being nice 24/7. On Food: I’ll try to eat right. No more caffeine. Lots of water. On Technology: Thank you Google! On Money: Money is meant to be enjoyed and shared. On Career: As long as you’re happy! On Health: Truly understand now the meaning when they say HEALTH is WEALTH. On Men: They get so much better as they age. On Time: Ok, I should hurry! Done! Took me 2 weeks to finish this post. I hope I can blog more often. Supporting our President no matter what! Reliance on Foreign Aids leave us with a beggar’s mentality. I am not saying Foreign Aid is a bad thing, it never is and never will be, and I truly appreciate the countries who have helped us during tragedies but I hope Filipinos begin to realize that we are more than just a recipient of aid. Let’s all change the way we see ourselves. Let’s all take pride in being Filipinos! Choose a job you love and you will never have to work a day in your life. Relate na relate ako dito. I thank all the powers in this Universe who conspired to make it possible for me to experience fulfillment in my career. I don’t have much but I have everything! Whatever is hurtful to you, do not do to any other person. Planggana! I hope you are happy and well wherever you are. Currently my favorite song to date because, I don’t know. I thought it’s a very very sad song, sadly, it isn’t. HAHAHA. Yes, I oftentimes find myself basking in sadness. I don’t know, a lot has changed with the way how I see life now that tatay has gone to heaven. I get sad over the simplest of things. But I am definitely stronger. Next week, I promise to be BOLDER! I have moved on a long time ago. I am happier now. Sikapin mong maging masaya. Gawin mo namang worth it yung mga nangyari. While I feel like winning because finally, nagkatotoo yung “it’s not my loss”, I am also partly sad (mga 1%…okay, .05%)…pero hindi dahil sayo. I am just sad because paulit-ulit kong pinapakinggan ‘tong kanta. Back to what I was saying, I absolutely don’t regret anything. Totoo yun talaga. Now that we are talking again, hanggang dyan na lang yan. I am not even flattered. Whatever is hurtful to you, do not do to any other person. I never thought getting seenzoned is this…heartbreaking. Ang arte, hahaha! Seriously, I feel UNIMPORTANT and FORGETTABLE and it hurts because it’s true. Huy! Feelings ko naman ‘to and I have the right to feel this way. But it’s okay. Oo nga naman. Muntik ko nang makalimutan. Mas mahirap maputol ang dalawang sinulid, at mas matibay ang tahi kung dalawang beses tatahiin. Yun nga lang, higit na mas mahirap i-shoot sa karayom ang dalawang sinulid. Nasubukan nyo na? Parang electric fan lang din, mas malakas kapag nasa number 3. A so-so year so far, so what??!! Regardless, I am thankful for a lot of things. For one, I AM STILL ALIVE! Funny how I met and lost and found and lost you again. Love and hate relationship. Ginusto ko naman ‘to so yun na nga, embracing it. I am 100 miles away from my comfort zone! Undoubtedly, DU30 is my president. Miriam coming in at second. Who’s yours? Met a lot of new friends for keeps. Traveling solo soon! Sana out of the country, at sana lang kayanin ko. Although for the most part of the day, I am very independent, I am also very very clingy. Charot. And yes, just like everyone else, I also watch KalyeSerye. Jose Manalo is super funny! Lastly, I AM BACK! Ang busy ko kaya, hopefully, it wont take another 8mos before I can blog again. Should have started a few days back. 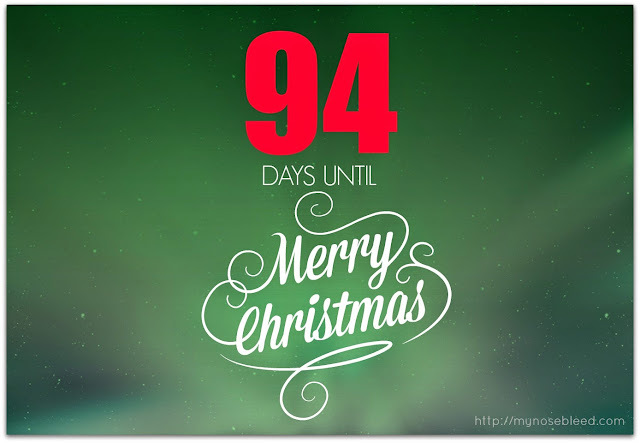 Anyway, it’s 94 days before Christmas! Wish you guys a wonderful season of giving and love! A lot of my friends are planning to get married/engaged this year! WHYY?? Hhaha. Because she knows how much I enjoy beading, one girl friend, graciously asked me to create a personalized lavender and silver wedding cord to be used on her wedding this November. I haven’t started yet, but as soon as I have all the materials ready, I’ll have it done right away. There’s one guy friend who probably thought I was a jeweler. Friend, I don’t have any idea about the price of engagement rings and gold wedding rings. HAHA. But I’m guessing they’re expensive. Don’t worry, I’ll ask, and if you need creative planning to help you execute your romantic proposal, I’m just a text away! Another friend who used to be adamant about getting married is finally taking the plunge! I feel so much joy for the two of you as you join your lives in marriage! Love you guys! And another guy friend who’s seriously considering of getting married right away (in 3 months time), after having told the girl about his feelings just recently. I am appalled!!! But if you feel in your heart that she’s the ONE, go for it! Early congratulations guys! Wish you all a lifetime of wonderful memories!